How many bands do you know from Kazakhstan? Personally, I know about a handful of names - just by name (and maybe I’ve heard something of them on the net or on a sampler, but nothing more than that). And to be honest, in my (limited, haha) physical collection, there’s only one name that appears: Scolopendra Cingulata. And I have to say that I do truly adore their demo Paccbet (from 2014; you can find the short review on the update of December 2nd 2014). 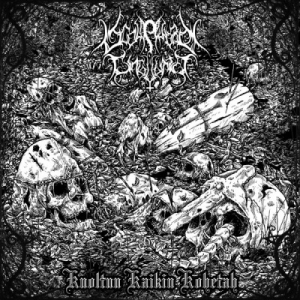 This band, hailing from the North-East of this huge country, did record four tracks that made it to the Kuoltuu Kaikin Kohetah EP (sounds Finnish, but who am I etc…). The result clocks twenty-seven minutes, which includes the ‘hidden track’ (lesser in sound quality than the others – see further), and it gets released in a partnership of More Hate Productions and Narcoleptica Productions, with professional distributing assistance of Satanath Records, Grotesque Sounds Productions and Dark East Productions. The four-track-EP, mainly written by drummer Aske, starts quite burzumesque (hey, ‘aske’ and ‘burzum’ in one phrase; is it a coincidence? ), you know, when the Count was still conquering the underground, and after little more than a minute, all Hell breaks loose. Scolopendra Cingulata perform a very melodic and highly Nordic-inspired form of raw Grim Black Metal. And the first thing that strikes me is the difference in sound quality, compared to the formed release. Still this stuff is rough and unpolished, but for sure it is much, much better! There’s even some kind of politeness going on, yet maintaining the raw-edged Underground sound à la the Second Wave; I would even draw comparisons to the legendary Grieghallen! Another striking element is the growth in song structure. The main base is focusing on that grim approach I just mentioned. Fast and furious excerpts overrule irrelevance, and it drenches the atmosphere in a misty and stench veil. Add some slower parts, perfectly and organically fitting, and each composition remains attractive, making the listener attentive from beginning till end. Great! Some pieces are strongly inspired by the Scandinavian scene in general, and the Norwegian more specific (and then I am referring to the nineties-era especially, evidently), but once in a while, Scolopendra Cingulata blast into thrashing madness, cf. the last song for example. But there’s so much more going on. It’s the details that make the difference, such as that unique (and yes, I know, extremely short, but worth mentioning) last bass riddle at the very end of the opening track. Or what about the fabulous, dreamlike, even hypnotic keyboard intermezzi or the (semi) acoustic guitar interludes? I truly appreciate the typifying screams of frontman and band founder SS. His throat is raspy and soar, and it surely strengthens the abyssal obscurity of the hymns on Kuoltuu Kaikin Kohetah. In an organic (orgasmic?) way, it corresponds impeccably to the melodies and rhythms as well, professionally performed by some older and new collaborators. And that individual play sounds truly decent and clear, thanks to the aforementioned superiority of the production duties. So, in conclusion: not renewing, yet still highly recommendable, because of the own-faced approach and the excellent songs. A must for fans of the universality and timelessness of the True Black Metal current!